Last year I subscribed to Quinciple for a few months and received a weekly box filled with goodies from the farmers’ market (and sometimes from other states). I chose Quinciple over CSAs because I wanted the flexibility that they offer (you can cancel a week before). They send you recipe cards as well but I never used their recipes. I was very happy with most of the boxes we received but I haven’t subscribed at all this year because I started going to the Union Square Farmers’ Market myself. 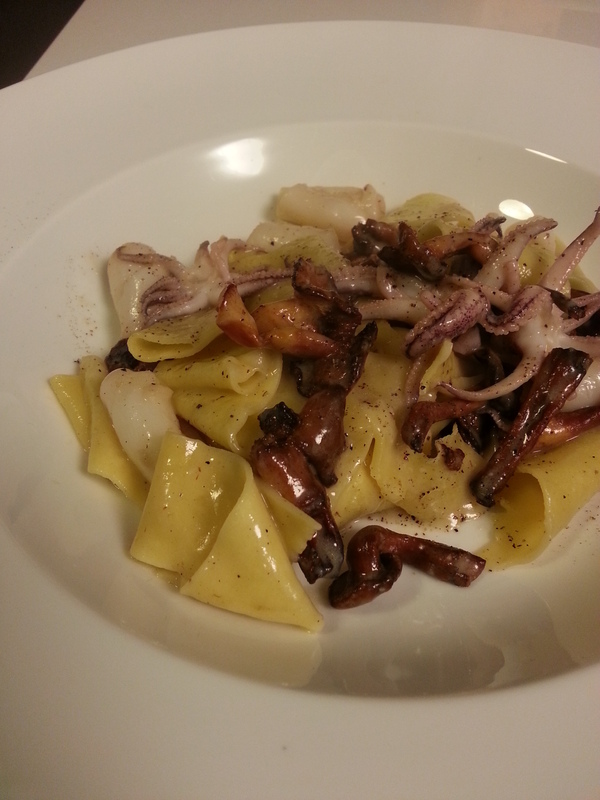 This is something I cooked up when I had squid and hedgehog mushrooms in the box (we made fresh pasta a few days before and had some in the freezer). 1/3-1/2 pound fresh pasta (pappardelle or any pasta of your choice)- you can buy fresh pasta at the market! Heat some olive oil in a saute pan over medium heat and when it starts to get a bit smoky, add the hedgehog mushrooms. Once the mushrooms have a nice sear on all sides, add the squid and lightly cook through until no longer translucent. Lightly season with salt and pepper (do not fully season since the pasta will be salted from the water). Meanwhile, add the pasta to the boiling water and cook until just before it’s fully cooked through. Reserve some of the pasta boiling water in a bowl. Drain the pasta and add to the pan with the squid and mushrooms. Toss together and add the butter (add a bit of the pasta boiling water if necessary). Turn off the heat. Keep tossing until the butter coats everything. Serve with some extra cracked black pepper.